I don't think I have ever met a dog that didn't like eating treats. Treats are also fun to for us humans to give to our dogs. That doesn't mean we should just toss them any old snack or goody that we find. It's important to give our dogs treats that are healthy and safe to eat. Wouldn't it also be cool if we could give our dog a treat that served some sort of function other than just being tasty? Cloud Star's Dynamo Dog Functional Treats do just that. 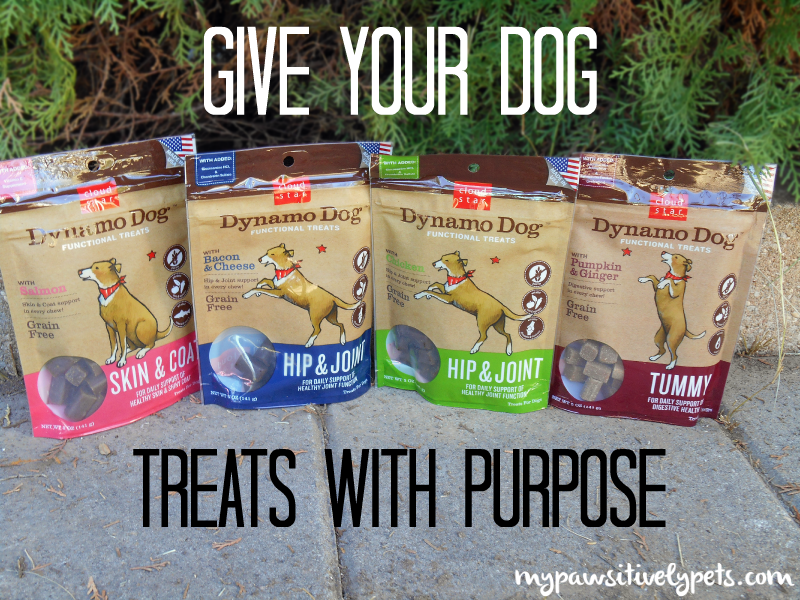 There are 3 different treats in the Dynamo Dog Functional Treats line including Hip & Joint, Skin & Coat, and Tummy. Each on of these treats provides your dog more than just tasty goodness. 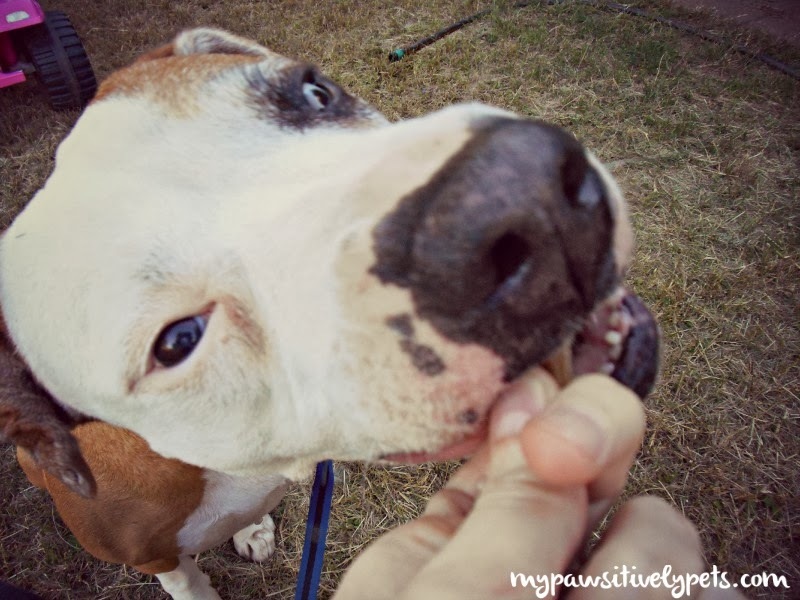 Shiner and I were sent some of Cloud Star's Dynamo Dog Functional Treats to test out. Shiner is an expert dog treat taste tester now, and she couldn't be more pleased with these treats. But, Shiner likes to eat just about anything so it's important for me to do my part in the review process as well. As I was reading about the Cloud Star company and their Dynamo Dog Functional Treats, I was definitely pleased. The company is dedicated to providing quality dog treats and also gives back with charity. They feel that "doing good business should include doing good things for others". All of Cloud Star's dog treats are made in the USA and the company has never had a recall. The Dynamo Dog Hip & Joint Treats are grain free AND gluten free. I don't see too many gluten free dog treats, so it's great to see this with these all natural treats. These treats give your dog a little extra chondroitin and glucosamine for healthy joint support. These treats come in Bacon & Cheese flavor and Chicken flavor. The ingredient list makes me happy too. Pork or Chicken is the very first ingredient. They also contain ingredients like carrots, apples, spinach, sweet potato, and cranberries. All of the Dynamo Dog Functional Treats are not crunchy, but rather seem to have more of a chewy texture. The Dynamo Dog Tummy treats are also grain-free and gluten free, and of course they are also made in the USA. These treats help support healthy digestion to make your dog's tummy feel good, just like it should. The Tummy treats contain probiotics, ginger, and pumpkin. Plus lots of other good fruits, vegetables, and herbs as well. I don't see any meat on the ingredient list for these treats, but Shiner doesn't seem to mind at all. Finally, Cloud Star offers a Skin & Coat dog treat in their Dynamo Dog Functional Treats line of products. 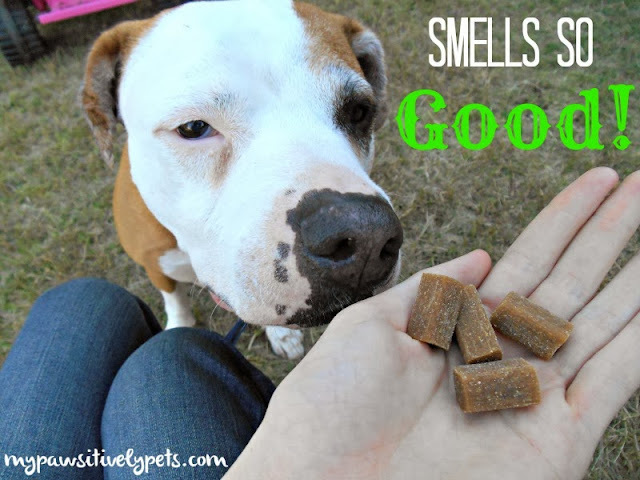 These treats' function is to help support a healthy skin and coat, of course. Just like the other treats, these are all natural, made in the USA, grain free, AND gluten free. The Dynamo Dog Skin & Coat treats have Salmon Oil and Vitamin E in them, along with some other goodies like Salmon (as the first ingredient), apples, carrots, sweet potatoes, flaxseed, spinach, and more. While Shiner's opinions matter a lot in this review, mine do too. If Shiner were allowed to eat anything, she probably would. I however have to give these treats a very big thumbs up! I can't really see any negatives to the treats. If you're looking for a safe and healthy dog treat for your dog, these Cloud Star Dynamo Dog Functional Treats are definitely something I would recommend. And I love the fact that they serve a purpose other than pleasing our furry friend's taste buds. The nice people from Cloud Star have offered one of our readers a chance to win some of these treats for their own dog! One lucky person and their dog(s) will win one bag of each Dynamo Dog Functional Treats as shown in this review. US residents only please. All you have to do is leave a comment telling me which Dynamo Dog treats your dog would probably like the most. (Don't forget to check off that you commented in the Rafflecopter afterwards!) There are ways to earn extra entry points as well, but they are not mandatory. The giveaway starts now and will end on November 20th at midnight CST. Good luck! *We were provided the products mentioned in this post at no charge. We received no other form of compensation. All opinions expressed in this review are our own and completely honest. Great review! I didn't enter because we are also going to be doing a review/give-away for them in the next couple of weeks. Good luck to all who enter! Hey, I bet pigs would like the too! I have given some to Nibblet. I would love to try the Hip and Joint products for my 4 middle aged /older rescue dogs. They would love to try any flavor! That's a super review! I love to read about treats and imagine I would get them all. Good luck to all US doggies ! Don't worry! Our Dynamo Dog treats are available in Canada too. If your local pet store doesn't already carry them, let them know you want to get them! Wow, those look tasty. And the whole good for you part, mom likes that. We'd love to try the stomach ones most. Probiotics are always great items in our book! And, Hey! The skin & coat are the only ones that have any of my allergens in it! I've got to find some of these treats! Yea, I was thinking of you when I wrote this wondering if they would be good for you too. Good luck guys! I really recommend them. Even if you don't win, the brand is wonderful and I'd pick some up next time you're at the store! Wow. Yummy treats with a purpose?!? That sounds fantastic! And the company is charitable? Even better. Great review, Miss Ann and Shiner! You collect proofs of purchase from treats bags and we donate money! That simple. Shiner we can see you are enjoying those yummy treats. Ignore us for the giveaway as usual. Our paws (all twelve of them) are in for Hip & Joint, Bacon & Cheese. They sound quite tasty! I think my dogs would like the Dynamo Dog Tummy Treats the most :) They like pumpkin! AND my 3 senior dogs would love the Dynamo Dog Hip & Joint Treats to help with healthy joint support. Glad you and Shiner enjoyed these. We tried them last summer, and they were a hit. In fact, I just got a box of Cloud Star's holiday treats in the mail today! Can't wait for my girls to try them! Watch the blog for my review! I just heard about those Christina and they do sound super yummy! I'm totally in support of pet supplies -especially food and treats that are made here in the USA. All of those recalls from China are scary! It is really horrible how many animals were affected by the problem with the jerky treats. Great review, Ann. You are so right, we know the dogs are going to love almost all treats, but we have to be sure they are good for them too! These treats really sound great, especially the ingredients. I think our dogs would appreciate the hip & joint treats since Sheba has arthritis and the two beagles are seniors also. They say they'd choose bacon & cheese flavor....go figure! Shiner, you are a good taste tester! My rescue dogs would like Bacon and Cheese Hip and Joint. Thank you for the giveaway and review Shiner. Good luck guys! Thanks for entering and glad you enjoyed the review. Shiloh would love all of them! If he'd have to pick one, I'd say the pumpkin though. They look so delicious that I want to have a bite!!! I would like to try the Dynamo Dog Skin & Coat treats! But they all look delicious!!! Our dogs would both LOVE the Bacon & Cheese flavor! The Tummy treats would be great for my little guy who just recently developed tummy problems, but still deserves treats! My rescue dogs would like Bacon and Cheese Hip and Joint. Pumpkin and Ginger...festive for the holidays! Yep! We will be reviewing some of their holiday cookies soon, so keep your eyes open for those. Pumpkin is good for digestion and ginger is supposed to help calm upset tummies. Yum! Love their dynamo treats! Whoops, I didn't follow instructions. I love their salmon one! I think my dog would like the Salmon flavored. The Skin and Coat treats would be something I'd like to try. I think my dog would love the joint and hip one... The skin and coat too! I'd love to try the Skin and Coat treats for my dog, he has dry skin. Gluten free, and grain free!? That sounds like good stuff for Joker!! Hip & Joint chicken or Skin & Coat salmon! BrainyPup has serious skin problems right now so he would especially love the Skin/Salmon treats! I'd give the Hip and Joint Bacon and Cheese to my sister for her dogs. The bacon one they would love! My dogs would love the bacon & cheese hip & joint treats. Thanks! My 4 dogs would love any one of these treats. Putting in my two cents for my dog and my rats. Both dog and mischief would love some treats. Bittle has a gluten allergy. So, I'm thrilled that she would be able to share with the rats. She's always jealous when she can't have what the rats are having. My pets would love any flavor. If they had to choose... Pumpkin and Ginger because they carved their own pumpkin this year and loved it. My dog would like the Dynamo Dog Skin & Coat I bet.